Winner of the 2010/11 RIANZ Tui for "Best Folk Album"
New Zealand Music Awards spokesperson Campbell Smith says it's great to see bluegrass coming to the fore. "Music can be about trying new things and challenging yourself, not only in what you play but also what you listen to and enjoy. 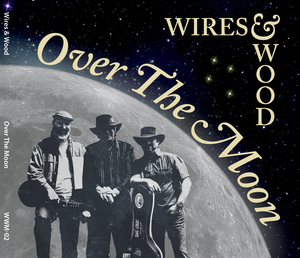 Wires & Wood has certainly captured that spirit with a powerful album that clearly demonstrates the band's dedication to the genre and excellence in its execution." Click to download the original album cover art. Micheal Young, Dave Warren and Bryan Christianson play mandolin, guitar and banjo respectively, with Alec Healy, Garry Trotman and *Lott* sharing duties on the bass. 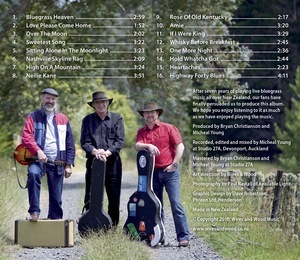 We are honoured to have one of New Zealands' finest Dobro® players, Read Hudson, appearing on a number of the tracks. The album is entitled Over The Moon from the name of a tune written by the band's banjo player, Bryan Christianson. The opening number Bluegrass Heaven was penned by bass player Garry Trotman and the remaining songs are the work of people such as Tim O'Brien, Bob Dylan, Bill Monroe and others.